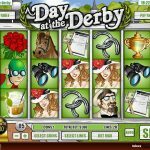 A Day at the Derby is a classic fruit slot only there are no fruits here cause it is horse racing themed. The graphics, animation, and audio all bring you to think you are actually watching the horses racing! The game is a 5 reel 20 paylines slot game that has been relaunched after a new modification for mobile. All there’s left to do is choosing your horse and off to the race course! So if you like the Kentucky Derby this is certainly the game for you! Even better, you can win a plethora of prizes there for finding a wide variety of themed items such as betting slips, binoculars, owners and trainers – and even a few glasses of Pimms. There are also loads of bonus games to play including Jackpot Jockeys, Free Spin Jockeys, Wild Horses and a Mystery Bonus Game. 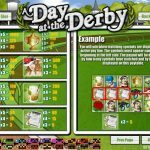 A day at the derby has four bonus symbols. two jockeys and two horses. The Jackpot Jockey is the one wearing green and red will win you the max jackpot at a total of 2500 coins when you get 5 of him. The blue Jockey will get you free spins and you will need at least 3 to trigger the free spins. The nice thing about it is that all prizes will be tripled during! The Wild Horse appears on reels 1-3 and can replace any other symbol to form a winning combination. Also, bonuses are multiplied by the number of wild horses. Last but not least is the Bonus Horse that triggers a mystery bonus! 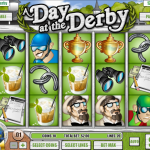 A day At The Derby is a very fun slots game that offers lots of extras. and extras as a thumb rule are very good. It is not the most sophisticated slots game but again fun! and if you love the Kentucky Derby this is certainly the game for you! Love 5 reel slots? Try All Aboard, a 5 reel slot by Rival.